Kelly wants to be making her own films, but instead has been doing publicity for a studio. She doesn't like her job, drinks too much and is having an emotional affair with Garret, a co-worker. She is young and should be having the time of her life, instead she is stuck and pondering the what-ifs about her quasi relationship with Garret and with Christian, her high school boyfriend. I really didn't like Kelly when I first met her. She was so self-absorbed and heedless of the troubles she was stirring up for others. She had so much going for her, a good education, a well paying job, a condo and man who loved her, yet she seemed to be squandering it all. Her redemption started when she revealed her concerns about purchasing her condo with her boyfriend Rob. That brought out a whole different and responsible side of her, a side I could like. The three mothers in Kelly's life are so different from one another, but each care deeply about her. They have experienced so much in their lives, that she could learn lots about herself if only she would be listen to them and be honest in her self evaluation. I thought this was going to be a fluffy book without substance. Lots of shopping, drinking and flirting, but it turned out to be much more. 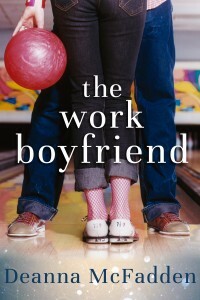 The Work Boyfriend begs you to stop and take a look at your life to double check that you're heading in the direction you truly want to be going. Cover image courtesy of author Deanna McFadden. Nice review, Heather. I enjoyed this book, too. Needlework Tuesday - What the heck am I making?